New legislation requires Russians with passports of two or more countries to inform the migration service on their own initiative, with those who intentionally conceal dual citizenship being criminally liable. A government representative claims that Russians who are a citizen of more than one state are a threat to patriotism. According to new legislation, any Russian citizen who acquires another nationality must inform their local migration office within 60 days of receiving dual citizenship. The law regarding dual citizenship, which entered into force on August 1, is the result of a discussion between Russian President Vladimir Putin and members of the Federation Council in March 2014. At the meeting, President of the Constitutional Committee of the Federation Council Andrei Klishas proposed that Russians holding dual citizenship should be required by law to inform the authorities of their second citizenship and punished for hiding it. Putin approved the idea, but asked not to overdo it. "We must know and we have the legitimate right to know who lives in Russia and what he or she does," Putin said. Klishas had already drafted the bill, but the matter was then suddenly picked up by State Duma Deputy Andrei Lugovoi, who outside Russia is known as the prime suspect in the polonium poisoning of Alexander Litvinenko in London in 2006. Whereas Klishas had been talking about administrative liability, Lugovoi demanded that responsibility be criminal and ultimately won out. Russians who acquire citizenship in another country are consequently now required by law to inform the authorities of the fact within two months of obtaining it. If the deadline is not respected, a fine of 500 to 1,000 rubles ($14-28) will be imposed. And if Russians are discovered to have intentionally concealed a second citizenship, they may have to pay a fine of 200,000 rubles ($5,530) or be obliged to perform 400 hours of compulsory community service. Moreover, Russians also have to inform the authorities about any children's second citizenship. Russia's constitution permits Russian citizens to have dual citizenship. However, the owner of two passports is considered exclusively a Russian citizen, except in cases that are provided for by international agreements, such as the one Russia has in place with Tajikistan and Turkmenistan. Lugovoi, who is vice president of the Duma Security Committee, justified the necessity of amending the legislation by saying that it was necessary in order to support patriotism. 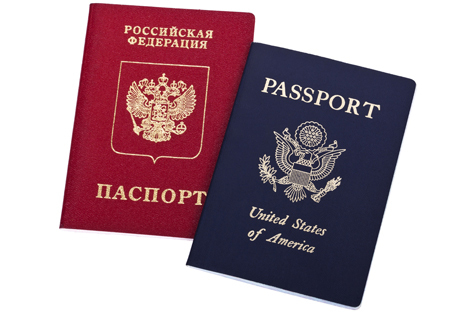 "Having dual citizenship diminishes the importance of Russian citizenship," Lugovoi remarked. "In this case the Russian citizen is connected to another government and is forced to carry out his constitutional obligations with that other government," he said. He recalled Russia's "foreign enemies" and stated that Russia is "in an aggressive world, therefore the government must know about dual citizenship." Klishas then reminded everyone that in some countries, such as the U.S. and Latvia, a person possessing their citizenship swears to respect the interests of those countries. While the bill was being discussed, deputies from various parties suggested that by passing this law, the government wishes to uncover officials who have secretly obtained dual citizenship, which would be illegal. The holders of foreign passports themselves do not know how to respond to the law's requirements. "I've been calling the Federal Migration Service for two days and no one answers," says Natalya Savyolova, who lives in Germany, but now intends to come to Russia, where her parents live. "It wasn't written anywhere how to inform the authorities. What’s more, I don't think it says that the law affects those Russians permanently living abroad. I permanently live in Germany but sometimes come to Russia for a few months. Should I inform them or not? Why does Russia have to know about it, if I spend most of the time in Germany anyway?" Meanwhile, the issue has provoked widespread discussion on internet forums, with some arguing that if you do not take out your foreign passport on Russian territory and leave the country with your Russian passport, then no one will find out about your second document. Others are convinced that any knowledgeable lawyer will prove the meaninglessness of this law in court, since Russians inform government officials of any other citizenship when, for example, they apply for their international passport. Head of the Presidential Human Rights Council Mikhail Fedotov stated that despite the possession of a second citizenship, a Russian is still a citizen of Russia. "In case of an absence of an agreement between Russia and the other country, we do not recognize this country's citizenship," says Fedotov. "That is why it is absurd to require the communication of a citizenship that we do not recognize." President of the Civic Assistance Committee Svetlana Gannushkina noted that with this law the government has labeled people with dual citizenship as spies and suspicious persons. "These people will prefer to hide their possession of a second citizenship in order to avoid contact with officials," says Gannushkina.